Allied soldiers from Belgium, Britain and France are surrounded by the German army and evacuated during a fierce battle in World War II. This looks beautiful and bleak and perfect. Most terrifying war sound design I've ever heard. Can't stress this enough. Ranges from claustrophobic to grand in a meaningful way at the right moments. Very Christopher Nolan but very different from anything he's made before. It's more of a modern thriller than a conventional war film. Definitely a big screen sort of movie (Nolan means what he says when he talks about the superiority of the cinema experience). That said, it's a damn shame I couldn't catch it in IMAX. I'm curious to watch it. I welcome the fact that he doesn't seem to have one protagonist. Nolan is bad at characters, I think. I'm sure he can film a war and everything in it. For what it's worth, I like a lot of Nolan characters. But this is Nolan's most stripped down film and it steps away from the characterisation and conceptual/philosophical chatter of his earlier works. Because it's so in-the-moment, a lot of the character building stuff is quick action and reaction type stuff. Those, as character moments are great. You don't get much time to get attached to the characters but I think it works in its favour- I was still definitely rooting for a handful of them. I honestly wasn't sure what to think for the first twenty minutes or so. You're so quickly thrown into such intense waters that it's hard to get a feel for where you're headed as you're too busy trying to stay afloat (I need to see it again as I hard a hard time tracking the first act due to the heavy accents and rapid-fire war exposition). Once I got a better picture of everything, I really enjoyed myself. Nolan doesn't need character background in this one so it doesn't take that hit that his other movies often do from his cold approach. The 70mm looked amazing (they even showed a couple trailers projected and it made me miss film so bad) and there was maybe one scene where I could tell CG was used and that was only because I knew it had to be, not because it looked like CG. Everything else was so well done and so immersive I just bought it all as real. I think it was rumored earlier that Aronofsky's Mother trailer was attached. Any luck on that front? Not at my screening. We got mostly DLP trailers and then two 70mm trailers... Justice League (woof) and Blade Runner. I've been underwhelmed by the last Nolan movies. Their flaws always messed up the experience for me. Dunkrk overwhelmed me. It's one of his best films. The physicality of the spectacle is what is missing from a lot of movies these days. Watching the trailer of the new Spielberg after having watched Dunkirk must be quite heartbreaking, I guess..
And it's quite moving to see how he managed to master what he was trying to do with time in Interstellar in this movie. 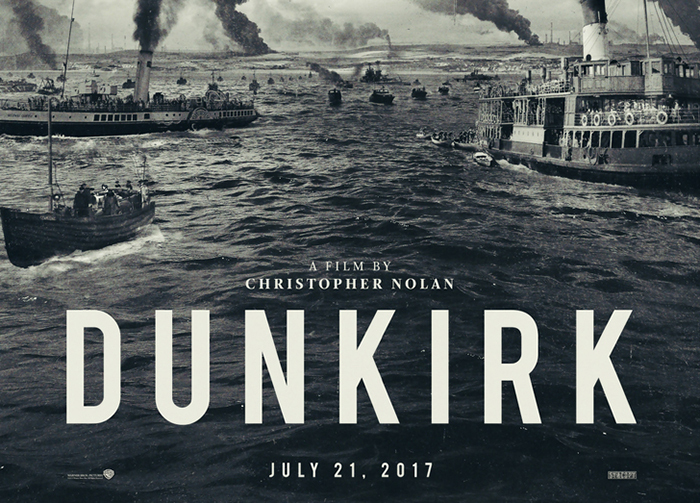 Having read a little about the actual Dunkirk, I was disappointed by how small-scale this movie was — a few hundred soldiers on the beach, two allied planes, a couple dozen citizen rescue ships. I respect the choice to focus on a handful of characters, that's necessary and fine, but this bears no resemblance to the magnitude of the Battle of Dunkirk or the escape. I don't understand the choice to make this a bloodless war film. Bombs fall and create limp bodies but no carnage. Bullets hit people, but we aren't shown what happened. This is weirdly not as horrifying as it should be. Seeing the ships sink so quickly was horrifying, I'll give you that. But all the death was strangely muted. This feels more like an adventure story. And nearly all the protagonists survive. Considering that 11,000 British soldiers died because they were not able to escape, none of that feels quite right. The chronological shuffling was good. That actually worked. Things were not too hard to follow. People who are calling this an experimental film are out of their minds, though. This is one of the best films of 2017 and Nolan outdid himself with this.